I don't know about you folks, but I thought that picture of what might be the 2015 Subaru WRX left a lot to be desired. 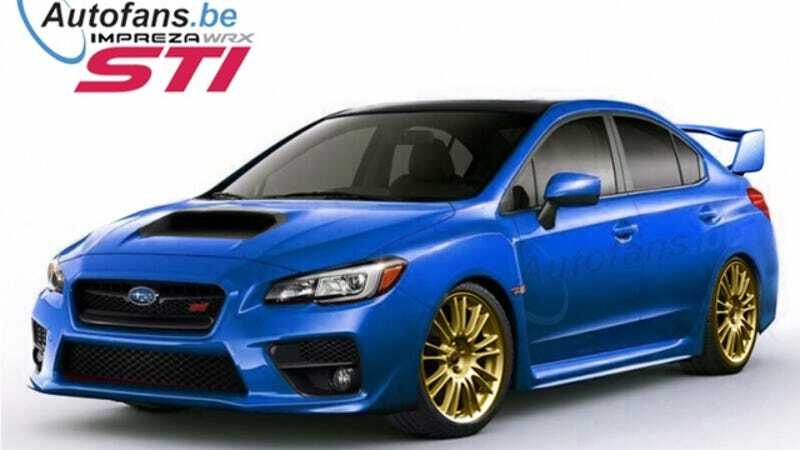 Fortunately, this render of a WRX STI version proves that rally blue paint, a huge wing and gold wheels make everything look better. This render — and again, I stress that it's a render and not the actual car — comes to us from our Belgian pals over at Autofans, who felt that that red Impreza with a hood scoop and a more aggressive front bumper could use some spicing up. They gave the STI version the wing we've seen on various pre-production mules, as well as the carbon fiber roof from the concept version. Not bad, right? Let's hope the real car looks closer to this than the image we saw this week. Head over to Autofans to check out a shot of the rear end, too.